A revolution is occurring in business today. Companies are realizing that the 80/20 rule is no longer an acceptable way to compete in today's market. As the need for companies to increase productivity and do more profitably with the same or fewer resources grows, so too does the desire of workers to engage in work that matters to them. With over 70% of today's workforce feeling disconnected and disengaged at work, something new needs to happen. Enter the core concept of putting more people in seats that suit them while at the same time benefiting from the resulting increase in energy, engagement, and performance. Using her Core3Coach approach, Cynthia helps business owners, leaders and teams SHIFT the entire performance bar up - lifting the lid on excellence for themselves and throughout their organization. 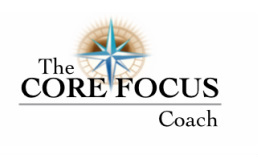 Through her unique Core Focus Approach, she not only coaches individuals to discover and leverage their own unique core but also connects their companies with powerful resources to put more people in roles that fit both them and the organization. By developing Core Focus Profiles for individuals and teams and matching those with the needs of Key Performance Roles, more people flourish throughout the organization and overall performance rises. These shifts occur and multiply, eventually making excellence the rule and not just the exception, individually, across departments and throughout organizations. For More information about this revolutionary approach to raising energy, engagement and performance in the workplace, click the links above to schedule a call to learn more or Contact Us and we will have one of our coaches connect with you to explore your needs and how this amazing approach can benefit you and your organization. Discover How You Can Raise the Energy, Engagement and Performance Across Your Entire Department and Throughout Your Organization. More People Having More Fun at their Jobs with Higher Returns for Your Business. It is Possible and Simpler Than You May Think.